When I bought my new SD memory cards my first thought was to go by the old “standard” SanDisk as I had done for several years … But looking around I saw that other brands were MUCH lower in price so I began to consider buying some other brand. After some research I found one that I thought had a good price and had got decent comments on the web. 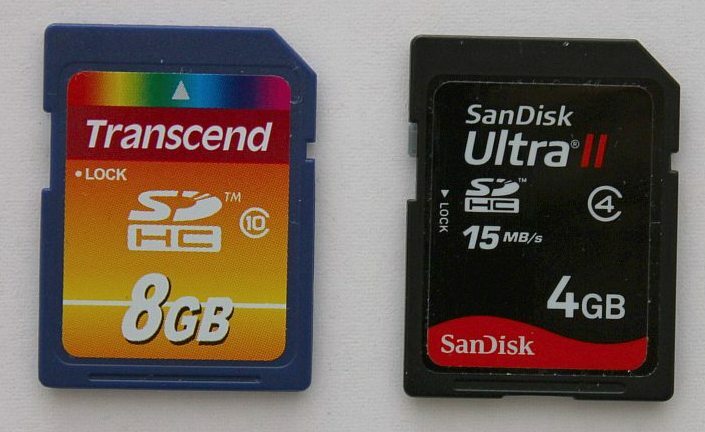 It was the Transcend 8 GByte SDHC Class 10 memory card that I bought from Amazon for just £11.99 – less than half price compared to the SanDisk Extreme HD Video card and that is “just” class 6 but has added 20 MBytes/sec! The two most important aspects of a memory card is first flawless operation over time and a speed that does not limit the camera … or me! I do NOT want to lose pictures because of the memory card failing on me! Taking pictures I very seldom take burst of pictures – and when I do it is never more than 3-5 at a time. Bracketing sometimes and the odd horse jumping over a hurdle. That shows I have small requirements for speed when taking pictures. Having started filming in full HD with my Canon EOS 550D I required the card to handle the 330 MBytes/min sustained writing (according to the manual) – which translates to just 5.5 Mbytes/sec. This would make it at least a class* 6 SDHC card but I decided to up the margin a little and went for a class 10 SD card. One very difficult area when comparing things is getting facts that actually show something that is both correct and at the same time meaningful and worthwhile. Finding out durability and how well something works over time I just could not handle in any reasonably correct way (without it taking many years 😉 ) so I gave that up! Then from curiosity I thought about finding out the speed in a real world setting! I wanted to find out what was the speed in the camera! Having an “old” SanDisk Ultra II Class 4 15 MByte/sec 4 GByte card and my new Transcend Class 10 8 GByte card I set about my task. How big was the difference between these two cards? They had quite different specs – I decided against any synthetical test and wanted a test in the camera! This way I would get facts about how these cards worked in my camera – most things considered – and not i my “laboratory”! It was only the write speed that was interesting in the camera so that is what I set out to find out! The read speed I wanted in the computer with my card reader – so more things influenced the results! I used my Canon EOS 550D for all the testing. SanDisk SDHC Ultra II – 10.86 MBytes/sec. Less than 2% difference! Nothing to worry about. The Transcend memory is a good buy – write speedwise at least! One thing to note here is about the SanDisk card which is a class 4 (4 MBytes/sec) but manages – in this test – to more than double this! I stress that this is in this test – I have not followed the proper procedure for SDHC class testing – and I am not checking for short dips in the constant writing speed – I am doing an average over roughly 10 seconds! Canon states quite clearly that at least a class 6 card will be required for HD video! SanDisk SDHC Ultra II – 64 secs – 17.66 MBytes/sec. Again less than 2% difference! Nothing to worry about. A good buy read speedwise at least! One thing to note here is that while the SanDisk says something about reading at 15 MBytes/sec (and handles that beautifully) the Transcend only promises 10 MByte/sec by being class 10 – but it also over delivers substantially! *) As you might know the “new” SDHC class translates to speed – class 4 is write and read with minimum 4 Mbytes/sec, class 10 is minimum 10 Mbytes/sec … as opposed to “before” when the maximum read speed given was much higher – under certain circumstances – and nothing was given about write speed! These new SDHC speed classes are very relevant for “constant” speed requirements like video where a dip in the writing speed could spoil your video – but could also be applicable to continuous shooting photos. If you on the other hand take series of photos even a camera like the Canon EOS 550D with “just” 3.7 frames/sec could output over 30 Mbytes/sec of jpg pictures. If you want to be able to handle that for long shooting sequences (>10 pictures) and minimize waiting times only the fastest memory will do! This is not a post on HD filming but I just want to add that the Canon EOS 550D takes absolutely beautiful full HD movies – anytime – day or night! Especially at low light! This entry was posted on September 14, 2010, 10:37 and is filed under Camera Stuff, SD Memory Cards. You can follow any responses to this entry through RSS 2.0. You can leave a response, or trackback from your own site. Hi Photoman, pls.note Transcend memory you picture in your web site is not like the original posted on the manufacture web site, different labels (note the “transcend” word) and in yours, the bottom edge of the memory is plain when the original must have a break in. Plus, SDHC class 10 should have dark blue background, not yellow. I mention this cause at Argentina (my home land) there are a lot of “copies” of the memories and the packages are very similars making all customers confused. This sure is a tricky one! 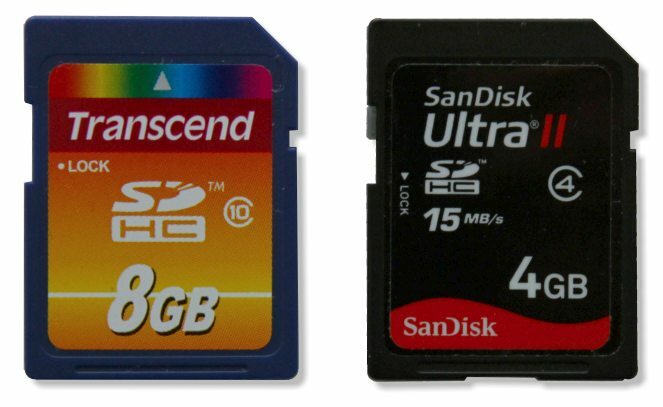 As I wrote I ordered my to Transcend class 10 8GB SDHC cards from Amazon – the actual delivery was from another cooperating company. The outer packageing sure looked genuine – but it should should’t it!? I have had no problems whatsoever with my cards! I see the differences that you point out – and I wonder if it is just another newer generation with updated packaging. I will write to Transcend to see if I can establish if this is the genuine article or not! As I said I have no problem with my cards – but longterm stability might be a different thing… If I manage to sort this out I will post a comment on my blog! As you can see on the top of my page the memory passed the Transcend verification test! The colours on the labels has in fact changed over the last few months. Anyhow – thanks for telling me about it! Thank you so much for this valuable test! Glad you liked it! There are many tests to be found on the internet. I was looking for real world performance but found none – thats why I did this test!